When in comes to weather, Northeastern Ontario experiences the four seasons in all their splendour. From cool, misty spring mornings on the water to warm, sunny fall drives down winding highways, the region’s unique seasonal beauty is a breath of fresh air – literally. With over 184,000 square kilometres of geography, there is no denying our region is as vast as it is beautiful. As a result, the weather can vary dramatically from north to south, even in the same season, so a little advanced planning can make all the difference. Prior to traveling, we recommend checking the forecast in a city or town closest to you and planning accordingly. In Northeastern Ontario, the start of spring can vary dramatically from year to year. However, the one thing you can always count on is the BIG melt of our northern snow. If you’re considering enjoying the outdoors in our region during spring, be sure to pack your rubber boots and plenty of extra socks. Spring is also harvest season for Canadian Maple Syrup. The region has no shortage or sugar shacks brewing this delicious amber treat. There’s no more authentic northern experience than rolling a Maple taffy sucker on a fresh trough of snow – yum! Though many assume our region experiences cold weather year-round, Northeastern Ontario enjoys an average summer temperature of 24ºc (75.2 º F), which is the perfect weather to enjoy activities like paddling, hiking, fishing, boating and motorcycling. If you’re planning on visiting in the summer months, bring plenty of water and sports drinks to stay hydrated and be sure to pack clothing with vents and liners that can be layered to help you stay comfortable. Sunscreen is a must, especially if you’re spending a day on the water, and mosquito spray with DEET will become your best friend during woodland excursions. If you’re cruising around on a motorcycle or ATV, rain gear is a great compliment to your safety equipment. Fall is easily one of the region’s most spectacular seasons. With the foliage transforming into a kaleidoscope of brilliant colours, sunny days are the perfect backdrop to an unforgettable family outing on the trails or for a fall drive down winding roads lined with maples, poplars, oaks and evergreens. Though the days may be warm, evening temperatures can be quite chilly. Pack additional layers to add on as needed and plan for a cozy campfire with hot cocoa and fire-roasted marshmallows to stave off the autumn chill. 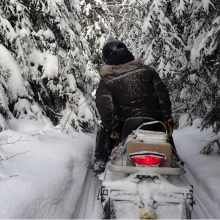 During the winter months, Northeastern Ontario is transformed into a genuine winter wonderland. For the snowmobiler, snowshoer, ice-fisherman, cross country skier, and general lover of the outdoors, the region’s sparkling frozen waterways, ice-tipped branches, and BIG, fluffy pillows of snow blanketing the landscape are nothing short of jaw-dropping spectacular. To combat the cold weather, be sure to pack wool undergarments and proper winter gear such as lined boots, lined mittens, a scarf and a toque. We also recommend a Chap Stick and hand lotion to help with winter dryness. A good set of winter tires on a 4×4 vehicle is a must for travels in remote, rural areas off the main highways. Weather occurrences such as summer storms and forest fires are natural occurrences in Northeastern Ontario. 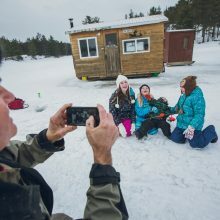 Visitors can use the resources on this page to stay up-to-date with the latest travel advisories, and plan a safe and enjoyable vacation in Northeastern Ontario.